I am super stoked to be reading my first Barbara Kyle book, though my series OCD is twitching because I'm starting with Book Three of the Thornleigh series without having read Books One and Two. However, I don't think it will effect me from enjoying it. I'm a few chapters in and so far the writing is great and I'm always glad to be in Elizabeth's company! Author Barbara Kyle will be stopping by Passages to the Past later on this month for an interview, so stay tuned!!! Have you read any Thornleigh novels and what are your thoughts? SYNOPSIS: England, 1554. In the wake of the failed Wyatt Rebellion, a vengeful Queen Mary has ordered all conspirators captured and executed. Among the imprisoned is her own sister, twenty-one-year-old Princess Elizabeth. Though she protests her innocence, Elizabeth-s brave stand only angers Mary more. 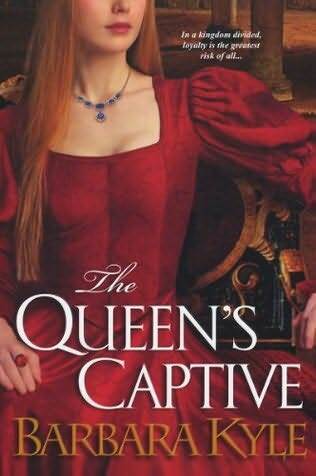 Riveting, masterfully written, and rich in intricate details, The Queen-s Captive brings one of history-s most fascinating and treacherous periods to vibrant, passionate life. no I haven't, but thanks to you I will probably check them out now :) Enjoy and I totally get the OCD of reading things in order. Jumping into a series bugs me, too -- although I'm rarely damaged when it happens. ;) I look forward to your review of this! No worries, Amy, my "Thornleigh" books stand alone - although I do hope that THE QUEEN'S CAPTIVE tantalizes you and your readers to check out the first book, where the adventure begins, and then the second book too! This sounds interesting, although I know what you mean about starting in the middle...I just did that with a book not realizing it was the second in a loosely connected trilogy. Your blog is fantastic, and I will be back often! Darling...I have missed you!! I must read this...Oh I must! !